A grinding machine is a machine for material removal with geometrically non-defined, bonded cutting edges, where the relative movement between tool and workpiece is rotational or linear. The machine further must provide relative feed and positioning movements between tool and workpiece. The movements between tool support (spindle) and workpiece follow a defined geometrical path – it is path defined. Material removal with geometrical non-defined cutting edges is considered as material removal that is made by a large number of cutting edges normally on abrasive grains, which are undefined, with respect to number, shape, and/or position, where the envelope over all stochastically distributed cutting edges defines the tool geometry. Grinding with linear relative movement is called pitch grinding. If the reciprocating linear movement is coupled with a continuous rotational movement, the process is called honing. Belt grinders, where a belt to which the abrasive grains are bonded is driven by the machine, also belong to the grinding machine. Either material contact can be in the area of the pulley or some linear belt support. So the cutting movement is either a rotational or a linear movement. The same kinematics might be used for polishing, but there the cutting movement between tool support and workpiece is not path but force defined, thus resulting in higher uncertainty of the surface geometry but better surface quality. As grinding machines belong to the class of machines for the material removal with geometrically non-defined cutting edges, those machines can be classified in correlation to the classification of the different process technologies with geometrically non-defined cutting edges as it is given in DIN 8589, parts 11, 12, and 13 (DIN 8589-11 2003; DIN 8589-12 2003; DIN 8589-13 2003). These standards belong to a group of standards based on DIN 8580 (DIN 8580 2003), where a hierarchical classification of all manufacturing processes is proposed. Table 1 shows the classification criteria in the different levels. The grinding processes are member of the material separation processes in the first hierarchical level and material removal processes with geometrically non-defined cutting edges on the 2nd hierarchical level. The third subgroup out of DIN 8589-part 0 (DIN 8589-0 2003) foresees to distinguish according to the criterion cutting motion between grinding with rotating tools, with belts and with linear motion of tools. As the machine provides the relative movement between tool and workpiece, the process classification at the same time determines a suitable machine classification, which is adopted here. Figure 1 shows the distinction made on the top hierarchy level in grinding machines with rotating tools, which are named rotary grinders, with belts, which are named belt grinders, and with linear motion, named stroke grinders according to the 3rd level of the process classification of manufacturing processes. Belt grinding machines use as tool a flexible belt on which a multitude of grains with geometrically non-defined cutting edges are fixed together with a supporting structure, which is necessary for defining the geometry, when the belt is pressed onto the workpiece. As the belt is driven and runs on at least two pulleys, the supporting structure may be one of those pulleys themselves or some contact shoe with a mainly single curved surface, which gives the belt the required shape in the contact zone with the workpiece. The 4th classification level criterion for processes is the surface to be manufactured and according to DIN 8589-11 (2003) is shown in Table 2 for the most flexible of those three classes of cutting motion generation, namely, rotating tools. This essentially holds for all classes of grinding operations of Fig. 1, but some specifications concern the typical technological possibility to generate the surface with the other cutting motions of Fig. 1. The classification for belt and stroke grinding processes is essentially the same; only thread grinding does not exist for belt and stroke grinding, and gear grinding, which is technologically possible, is not reported in the standards. Also cylindrical stroke grinding is not reported because it barely makes sense. Utilizing this classification of processes is limited due to the effect that a single machine is capable to operate in a multitude of those processes and to make different surface geometries as required by the end user. So a 2nd-level classification scheme of grinding machines with rotating tools is proposed and presented in Fig. 2. This scheme again may be used for all machines classified in level 1. A separate class of profile grinding machines is not necessary, because profiling can be done on a planar or a circular grinder. Also a class for thread grinding machines is not necessary, as those operations can be done on CNC circular grinding machines as well, as it already has all axes necessary for thread grinding. Only the rotation feed of the workpiece needs to be coupled to the axial feed according to the pitch of the thread. For noncircular grinding operations also the circular feed of the workpiece and the X-axis needs to be coupled to each other. On the other hand, eccentric grinding machines are special purpose machines that can be separated from the circular grinding machine, because they are equipped with very dynamic X-axis, which changes the machine structure significantly. Nevertheless, circular grinders and noncircular grinders are closely related to each other (Fig. 3). The third class of machines with coupling between axes is the generative gear grinding machines. DIN 8589-11 (2003) distinguishes between continuous and discontinuous gear grinding and also between internal and external gear grinding. In the case of continuous gear grinding, the tool is a worm grinding wheel as shown in Fig. 4, and the rotation is coupled to the rotational feed of the gear workpiece; in case of the discontinuous gear grinding, the rotary axis of the gear is coupled to a linear axis of either the gear or the tool. The continuous gear grinding machine is the most efficient grinding machine for gears. Those machines as can be seen in Fig. 4 also differ in structure and functionality strongly from the other types of grinding machines on this level. Speciality in grinding is processes without defined feed motion of the workpiece. According to the scheme of DIN 8580 (2003) and DIN 8589-11 (2003), those processes cannot be distinguished before the 8th level due to the defined criteria. Those processes, centerless grinding and double-wheel planar grinding, are shown in Fig. 5. The related machines are according to their appearance, structure, and functionality different in every respect, which shows the limitation of a classification scheme for grinding machines adopted from a process classification. Thus, deviating from this classification scheme, they are distinguished on level 2 of the grinding machine classification scheme. The feed motion is established by frictional contacts, namely, the relative speed between grinding wheel and control wheel in the case of centerless grinding and between two grinding wheels in the case of double-sided planar grinding. Those machines can apply the same principle as for the feed also for the automation, which means transportation of the workpiece through the grinding zone. They are thus the most efficient and productive grinding machines for mass production. It must be mentioned here that for centerless grinding machines also a class without exploitation of the feed motion for the transport of the workpieces exists, which is called centerless radial infeed grinding. More details on centerless grinding and the corresponding machines are given in Hashimoto et al. (Hashimoto et al. 2012). Level 5 for the process classification distinguishes between external grinding and internal grinding. Therefore, internal and external grinding machines are distinguished, as shown in Fig. 6 for cylindrical grinding machines. Form grinding can be subclassified in level 5 according to the way how the freeform surface is generated. This can be adopted for the subclassification in level 3 of the grinding machines. But in modern machine building, nearly all form grinding machines generate the geometry by CNC control, which means that coordinate grinding machines prevail in this subclass. Level 6 classifies the processes in all classes of level 5 in different contact situations between grinding wheel and workpiece in the grinding process, which definitely is no more useful for the classification of grinding machines as it restricts the machine application too severely. But for grinding machines, a final classification level to distinguish the different assemblies of axes is useful, because this often also changes the design of machines basically, including the machine bed, and is also a question of how many axes are on the workpiece and the tool side. This can be seen in the different internal grinding machines of Fig. 6 as well as, for instance, the different planar grinding machines in Fig. 7. Universal grinding machines: As shown in Fig. 6 2nd row, right, they are derived from circular grinders and are a subgroup of them. Those machines are capable of performing internal and external grinding tasks. Similar to most external grinding machines, universal grinders are also equipped with pivoting devices for the spindle of the grinding wheel. For universal grinders, the pivoting axis is necessary to switch between internal and external grinding wheel. Thus, universal grinders without pivoting axis barely exist. Such a pivoting axis with tool changer functionalities is shown in Figs. 6 and 8. The pivoting axis can be built as half-NC axis, thus being only capable to change the grinding wheel and adjust it in a certain angle to the workpiece axis. But more advanced machines have fully interpolating pivoting axes. Figure 8 shows possible equipment of the pivoting axis with different kinds of grinding wheels and also tools for internal grinding. Tool grinding machines: These machines shown in Fig. 9 left emanate from the idea to have a specialized machine for finalizing a cutting tool, such as drill, end mill on one machine. Those machines normally have five to six CNC axes and specialized software as required to manufacture cutting tools. These machines must be subclassified to form grinding machines. 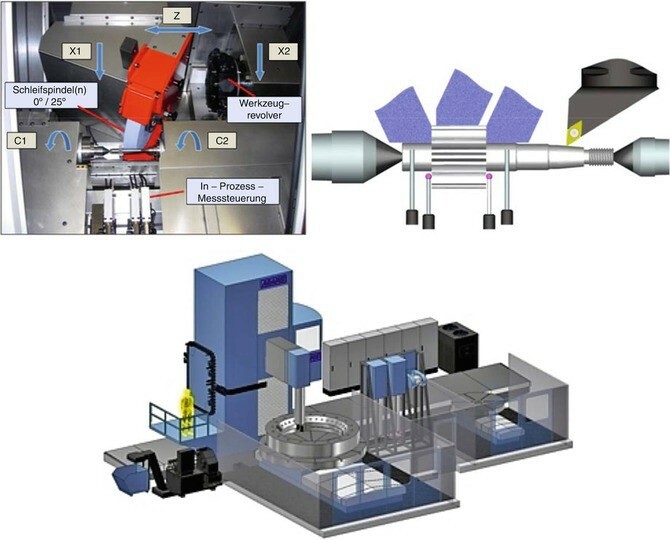 Coordinate grinding machines: These machines shown in Fig. 9 right are normally the most flexible machines and the machines to accomplish form grinding operations. They are capable of planar grinding, circular grinding even generative gear grinding as well. The task is to finalize geometrically complicated workpieces also in one clamping situation. Those machines are often huge machines similar as in Fig. 7 e either with vertical or horizontal spindle. The architecture of coordinate grinding machines resembles the one of milling machines with 3–5 axes. Grinding machines are also developing to grinding centers similar to milling centers, being frequently equipped with a tool exchanger that exchanges the grinding wheel as well as the coolant supply, which strongly depends on the shape of the grinding wheel. Finalizing workpieces in one machine is also the driving force behind developments of combi-machines, machines that combine grinding and other material removal mechanisms. Very common in the meantime are combined turning and circular grinding machines. Observed are also combined milling-grinding machines. Combi-machines, capable of multiple surface treatment processes, namely, grinding combined with polishing, roller or ball burnishing, and even laser hardening, are known. As example for those combi-machines, a grinding-turning machine is shown in Fig. 10 according to Studer (Studer and United Grinding Group 2014) and Adams (Adams General Power 2015). The axes of grinding machines are nominated as in ISO 841 (2001). Always the z-axis is pointing in the direction of the tool spindle as it is shown, for example, in Fig. 6. As the grinding tool wears fast in contact to workpieces, grinding machines normally are equipped with dressing devices, as can be seen, for instance, in Fig. 5 bottom left. They are meant for interacting with the grinding wheel from time to time to reestablish the macro-geometry and afterward the sharpness of the grinding wheel. Those dressing devices are either profiled rolls, covered with diamonds as abrasives, or generate the profile by at least two CNC axes. The dressers are mounted on the spindle stock or on the workpiece side. The latter has the advantage that the relative geometry between grinding wheel and workpiece is directly transferred to the grinding wheel and such at the same time as reestablishing the macro-geometry compensates thermal elongations between workpiece and tool. The advantage of dressers on the spindle head is reduced positioning times before dressing and the possibility to set up in-process dressing, which reestablishes the geometry and sharpness of the grinding wheel directly during grinding. Cutting speeds in grinding are by a factor of 5–10 higher. Therefore, grinding often uses very large tool diameters up to 600 mm. Grinding with small diameters requires spindles with very high number of revolutions per minute. The normal forces on the grinding wheel are significantly higher than the tangential ones and thus much higher than for milling with similar process parameters. Feed drives have higher thrust forces, guidings, and machine structure higher stiffness. Ceramically bonded corundum grinding wheels, which are the standard in grinding, are brittle and tend to break due to overload. Grinding machines need massive protections against failure of the grinding wheel. Grinding wheels are subject to significant wear. This must be taken into account, whenever designing a grinding process. Therefore, grinding wheels are regenerated on the machine, which is called dressing. Grinding machines have a separate CNC machine for profiling and sharpening of the grinding wheel. During dressing the grinding wheel size is reduced. This size reduction is measured within the kinematic of the dresser and provided to the CNC control for correct positioning of the newly regenerated grinding wheel. Processes with large material removal and thus large wear need in-process regeneration of grinding wheels. As the grinding process often is the final manufacturing step in a process chain, quality and accuracy play a major role. This imposes severe requirements on positioning accuracy and quality of the spindle rotation. This might be one of the reasons, why the tool changer did so slowly conquer the grinding process. With each tool change, a loss of accuracy of about a few micrometers is connected, which increases the radial and tangential runout. For precision manufacturing, the grinding wheel must be dressed after tool change. Because of the high rotational speed of the spindle, grinding machines need a balancing device to reduce centrifugal forces. To establish a grinding wheel after exchange, the geometric runout is reduced by the dresser, and afterward a static and dynamic balancing takes place. Grinding machines with oil as coolant require a fire protection. Grinding machines are preferably equipped with a contact recognition sensor on acoustic emission (AE) basis, to detect, when the grinding wheel touches the workpiece. With this very precise relative material, removal can be achieved. For high-quality parts, measuring devices for in situ measuring of the part geometry have been developed. Parts can be measured and corrected directly on the machine.